Do you Love The Scott Woods Band and Old Time Fiddle Music? Join our fan club! It's free! Simply provide your name, address, phone number and email address. If you are already part of our fan club and have moved or otherwise need to change your information with us, please provide an update using this form. Thank you for supporting The Scott Woods Band and Old Time Fiddle Music! Why become a Scott Woods Band Fan? 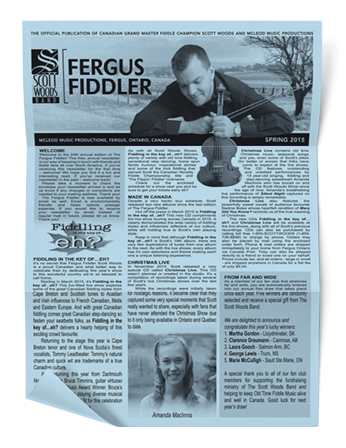 Every year, we publish The Fergus Fiddler and send a complimentary copy to all of our fans! The Fergus Fiddler is our annual newsletter that keeps fans informed of what the band has been up to, upcoming show themes or CD releases, what's in the works in the studio, special events and more. It also comes with the most recent tour schedule available at press time so you know when we'll be back in your area. As an added bonus, we carry out a draw from our fan club every January and 5 lucky winners receive a Scott Woods Band Prize Pack and an honorary mention in The Fergus Fiddler! Good luck to all of our fans!